Choosing the best out of Bordeaux from 2003. Continuing with my 2003 Bordeaux inquisition the following days tasting held by the Union de Grands Crus de Bordeaux here at Vinexpo was a more comprehensive representation of the Bordeaux communes with an impressive turnout from the northern Medoc appellation St- Julien. Noticeably absent were the Medoc first growths and right bank superstars such as Chateau Cheval Blanc, Chateau Ausone and Chateau Petrus, disappointing although predictable, otherwise avoiding a stampede. The super-second growth Chateau Leoville Las Case and St-Estephe top echelon Chateau Cos d’Estournel, Chateau Montrose and Chateau Calon Segur were not present either, a pity, as this is reportedly one of the better performing communes of the vintage. Evaluating more than 100 wines in one morning is not entirely enjoyable. I take my hat off to the professionals who have the discipline to remain focused when faced with the repetition of so many relatively austere wines in their embryonic youth, not to mention the clairvoyant talents necessary to see past often-insurmountable tannins. 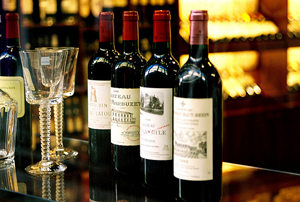 Continual exposure to en primeur tastings (the French term for “in its youth”) and repeated visits to chateaus is key to understanding Bordeaux, which the English wine trade and journalists undertake diligently. I was again underwhelmed with 2003s in this tasting, encountering a disconcerting number of flabby, pretty wines with lolly fruit, high tannins, lacking in character and distinctive terroir. There were also many wines with green capsicum, stalky bouquets and astringent tannins, all the signs of physiologically unripe fruit. The fact is that three months of drought conditions and scorching hot weather, although not as severe in Bordeaux as the rest of France, caused many of vines to practically shut down and not fully recover during the ripening period. But the marketplace had already jumped to the conclusion that the vintage was exceptional, predicated on increased ripeness, inaccurately comparing it to the great 1982. There are however, some outstanding wines and good value to be found, particularly in the St-Julien appellation. This commune is the “sweet spot” of Bordeaux, with many impeccably run properties and most vintages (clearly the case in 2003) delivering far more consistency and balanced polarity of elegant structure and opulent intensity. Chateau Gruaud Larose and Chateau Branaire-Ducru from St-Julien were both impressive. These two chateaus have hit top form in recent years, but are still underrated in the market, representing excellent value at about HK$4,290 per case (as quoted by British merchant Farr Vintners). My tasting notes read as follows. Chateau Gruaud Larose – exuberant, sweet bouquet of blackberry and blackcurrant among tobacco and earthy dark timber complexities; also some mocha from toasty new oak. Juicy palate of dark berries, layered with milk chocolate, very smooth with nice ripe powdery tannins and much better acidity than most, powerful finish. Chateau Branaire-Ducru – seductively perfumed with blackberry and stewed blood plum, coffee grinds and classy charred oak with lurking cold steel, gravely mineral notes. Inky palate, saturated with dark berry fruits; stewed blueberry sweetness, building towards fruitcake richness. Charming, silky textured, clearly very ripe but harmonious with fine tannins balancing out the lushness. Two monumental wines – Chateau Leoville Poyferre (HK$9,980 per case) and Chateau Leoville Barton (HK$9,260 per case) – demonstrate the superiority of the St-Julien terroir showing earthy minerals and forest floor complexities; intense layered fruit and well-integrated silky tannins. The star of the tasting for me was Chateau Pichon Longueville Comtesse de Lalande from Pauillac, possessing a provocative bouquet and flavors of blueberries, dark cherries and raspberries more akin to burgundy (probably why I liked it so much). It has a silky, creamy texture, seemingly invisible tannins, yet a concentrated and lingering finish. I also liked Chateau Lynch-Bages and Chateau Pontet Canet from this commune. For in-between celebrations, I recommend Chateau La Lagune, Haut- Medoc, (HK$2,715 per case) and Chateau Chauvin, Saint-Emilion (HK$2,429 per case), both incredible value and far beyond their status. They are both too approachable to go the long haul, but are ripe and balanced. The Chateau Chauvin is particularly voluptuous being 80-percent merlot, creamy textured and packed full of ripe blueberries and complex gun smoke, wet clay minerals; a sleeper of the vintage. Obviously, this is a personal assessment of 2003 Bordeaux, constrained to the wines present at the Vinexpo, and in no way intended to be comprehensive. My selections are puritanical, always seeking value; should the sky have no limit for your prince or princess, the first growths Chateau Latour, Chateau Lafite-Rothschild and Chateau Margaux are the pinnacle and nothing can compare with top Bordeaux for longevity. It goes without saying that when buying bordeaux, do your homework using the expertise of writers such as Jancis Robinson MW, Robert Parker, Steve Tanzer and the multitude of informative Web sites and magazines, Decanter, Wine Spectator and Wine Enthusiast to mention a few. I advise purchasing magnums for all long-term cellaring (1500ml equals two bottles), universally considered the best volume of wine to glass ratio for optimum cellaring and added insurance for a propitious 21st birthday. Personally, I will be procuring some Chateau Gruaud Larose Imperials (equivalent to eight bottles) that age much slower, maybe for my daughter’s 40th, which I hope to attend, God willing! It makes no sense purchasing Bordeaux intended for long-term cellaring landed in Hong Kong with adverse storage conditions and the prohibitive 80 percent import tax. The best option is to buy from a reputable merchant in the United Kingdom and have the wine stored in a bonded warehouse. For the best prices and range of Bordeaux (all vintages), I would suggest Farr Vintners who are also the leading en primeur merchant (Tel: +44 20 7821 2000, www.farr-vintners.com.You may also direct enquiries through their Hong Kong office (email: farrhk@farrhk.com or Tel: 2575 8773). For a reputable, smaller independent dealer try Noel Young Wines, International Wine Challenge Merchant of the Year 2003, one of the sharpest, most ruthless palates I have met (Website www.noelyoungwines.com or Tel: +44 1223 844 744). If you prefer dealing with a Hong Kong merchant, proprietor Paulo Pong at Altya Wines has his finger on the pulse of Bordeaux and can organize cellarage in the UK (Tel: 2523 1945, www.altayawines.com). In parting, the en primeur campaign for 2005 Bordeaux vintage is well underway, a vintage of incomparable quality in the past 100 years, to quote Robert Parker, “a once-in-a-lifetime vintage that has no peers.” If ever there was a vintage for birth year buyers, this is it, a bittersweet pill as it is incredibly expensive.